Hyaluronic acid is a glycosaminoglycan, a non-sulfated high molecular weight polysaccharide that is found in the extracellular matrix of all animal tissues. Hyaluronic acid is especially abundant in connective tissues, but also present in nervous tissue and epithelia. It was isolated in 1934 from the vitreous humor of the bovine eye. It is an extremely large molecule with a high capacity of hydration. This property gives the tissues resistance to mechanical pressures and lubrication, but also other functions related to cellular communication and differentiation. Although hyaluronic acid associates with other molecules in the extracellular matrix, it does not form covalent bonds with them, which is a unique feature among glycosaminoglycans. It appeared late in evolution, perhaps from the first chordate animals. 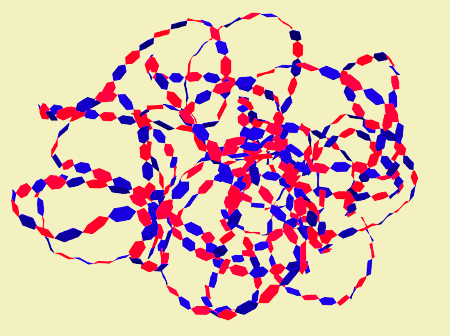 The molecular structure of hyaluronic acid was unraveled in 1950. It is a polymer formed by pairs of disaccharides, D-glucuronic and N-acetyl glucosamine, linked by alternating bonds: (1-3)-beta-D-N-acetyl glucosamine- (1-4)-beta-D-glucuronic. Some molecules can have up to 25000 repetitions of these pairs and reach 20000 kDa. In aqueous conditions it adopts a folded and globular organization, but if it were extended by pulling its two ends it could reach about 15 µm in length, greater that the diameter of an erythrocyte. Hyaluronic acid is dissolved in the extracellular matrix in the form of salt, as hyaluronate. In 1972, it was discovered that hyaluronic acid is able to act as a backbone to which other proteoglycans are associated by means of electrostatic bonds through electrostatic interactions. These molecules are other proteoglycans such as aggrecan, versican and neurocan. It acts as the backbone where these proteoglycans can be attached. This creates huge saccharide networks in the extracellular matrix. However, unlike other glycosaminoglycans, hyaluronic acid does not bind directly by covalent chemical bonds to polypeptides of the extracellular matrix; therefore, it does not form proteoglycans. Hyaluronic acid has a great capacity to hydrate, to associate with water molecules, since it has many negative charges in its molecular structure. Due to its size, a poor folding of its molecular structure, and to its ability to join water, it can create a large watery space inside. The proportion of water associated with its structure can be 1000 times greater than its own molecular weight. This favors the diffusion of not very voluminous molecules through the space that creates. However, other molecules of greater volume, such as some proteins, would be excluded. Even so, its structure constantly changes its organization, with which the possibility of diffusion trough it is variable. Diagram that wants to indicate the large volume occupied by the extremely long chains of a molecule of hyaluronic acid. Unlike the rest of the glycosaminoglycans, hyaluronic acid is synthesized in the plasma membrane instead of in the Golgi apparatus. Membrane enzymes called hyaluronic acid synthases carry out its synthesis; there are three types in vertebrates (HAS1, HAS2, and HAS3), and they are expressed differentially in different tissues. The synthesis occurs on the cytosolic side of the plasma membrane where monosaccharides are assembled; as the hyaluronic acid chain is synthesized, it is transferred to the extracellular space. Although all three enzymes synthesize hyaluronic acid, HAS2 seems to synthesize the longest chains. Interestingly, a gene homologous to the enzyme HAS1 has also been found in some bacteria, which synthesize it to increase their mobility. Probably these bacteria captured the animal gene. Diagram of the synthesis of hyaluronic acid in the plasma membrane by the hyaluronic acid synthase (Modified from Escudero, 2009). The metabolism of hyaluronic acid is very dynamic. The life of the molecules of hyaluronic acid can vary between 1 and several days. Roughly, 1/3 is replaced every day. Several types of enzymes degrade it: hyaluronidase, beta-D glucuronidase, and beta-D-N-acetyl-hexosaminidase. The most important are hyaluronidases. It can also be degraded in lysosomes after receptor-mediated endocytosis. In those tissues that are well drained by lymphatic vessels, hyaluronic acid is usually eliminated in the lymph, from where it passes into the blood, and is fundamentally degraded by the endothelial cells of the sinusoidal capillaries of the liver. Roughly, 30 % of the hyaluronic acid that is eliminated does it in the liver. A part of the hyaluronic acid is also eliminated in the lymph nodes themselves or is excreted (1% of the body’s hyaluronic acid) daily by the kidneys. Hyaluronic acid is the most abundant of all glycosaminoglycans. In the mouse, approximately half of the hyaluronic acid is found in the skin and 25% in the bones and joints. The rest is distributed between the muscles and the viscera. The zones where it is more concentrated are in the umbilical cord, in the synovial fluid, in the vitreous body, and in the follicle prior to ovulation. It is an important component of the synovial fluid of the joints, where it increases the viscosity of the fluid, and in the articular cartilage. The lowest concentrations are found in the liver and blood serum. It is also an important component in the nervous tissue. 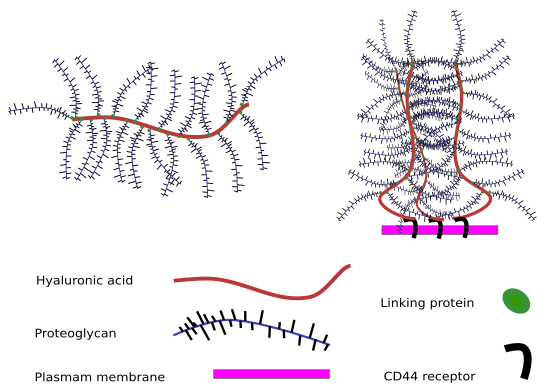 In the cartilage, although it is not the most abundant glycosaminoglycan, it helps to stabilize matrix proteoglycans, mainly aggrecan, where they form enormous aggregates that are arranged between the fibers of collagen. Diagram of the aggregation of hyaluronic acid with numerous proteoglycans to form enormous molecular structures. 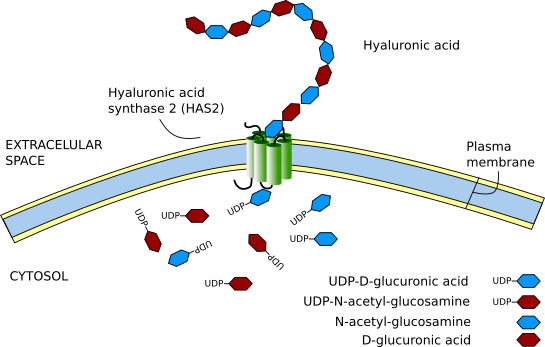 Sometimes, these complexes associate to the plasma membrane thanks to the CD44 receptors, which recognize hyaluronic acid (modified from Glycoforum). Sometimes hyaluronic acid concentrates around the cells. The cells have receptors in their membranes called CD44 that can bind hyaluronic acid, leaving it in the cell periphery. Sometimes it can be detected inside the cells themselves. The functions carried out by hyaluronic acid are related to its molecular characteristics. Because of its ability to join water, it is an excellent lubricant and provides great resistance to mechanical pressures, which also enables to regulate the water balance of tissues and their osmolarity. Hyaluronic acid helps to make up the network structure of the extracellular matrix through its interactions with proteoglycans or collagen. When it is very concentrated, it can interact with itself creating meshes or frameworks that give the tissue specific visco-elastic properties. The cells have specific receptors for hyaluronic acid, such as the CD44, TSG6, RHAMM and LYUE-1. Thus, beyond its mechanical and hydric properties, it has been implicated as a molecular signal in the regulation of cell proliferation, differentiation and migration. The most important is CD44, which is expressed in most of the cells. The degradation of hyaluronic acid allows permeabilization of the extracellular matrix, favoring the transfer of cells. Interestingly, the remains resulting from the degradation of hyaluronic acid have angiogenic and inflammatory character. A high concentration of hyaluronic acid in the extracellular matrix favors cellular stability and tissue integrity, while its degradation favors tissue-remodeling processes. It is a sign of tissue maturity. Hyaluronic acid is a good tool in biotechnology and medicine, especially in the processes of tissue repair and as a framework in tissue cultures. To this end, it helps that hyaluronic acid is not an antigenic molecule, that is, it does not trigger immune responses when it is inoculated into tissues. For example, its first medical application was in ophthalmology where it was used in injections to maintain the shape of the ocular cavities and as a substitute for the vitreous humor. In the repair of tissues, large amounts of hyaluronic acid are synthetized and thus it is used in medicine to heal wounds. In arthritis, it can be injected directly, also to repair wounds, in surgery of aesthetic operations, etc. It is also used for the co-administration of drugs. On the other hand, it has been showed that its presence is important in the niches of the stem cells, where it stimulates and promotes migration through the creation of physical spaces for the cells to move. During development, it helps the morphogenesis of embryonic structures. For example, it can be released from the basal part of the epithelia, producing curvatures, due to the large amount of water it attracts. It also favors intercellular spaces being more walkable by cells. For example, this process seems to be involved in the embryonic formation of heart valves. In cell cultures, a halo of hyaluronic acid is detected around the cells, which is secreted by themselves. The role of this halo is not clear but it seems to have two functions: to favor the mobility of the cell itself and that of protection. This protective role is because other cells, virus or large molecules cannot cross through that halo.